It's late so I chose art prompt number 5*, "Allow yourself to sit at your worktable for five minutes. Sometimes just getting to the table is the challenge, the rest is easy." I combined this with a project from Melissa Sweet's Drawing Book for Kids. The book was a freebie from the SCBWI conference and has been sitting on my desk. 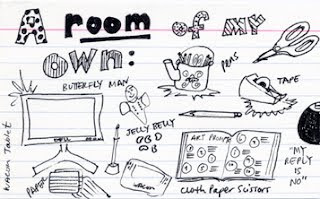 I flipped through it and chose a project of creating quick sketches of objects in my room. Easy enough. * Cloth Paper Scissors magazine (Jan/Feb 2012, page 80).